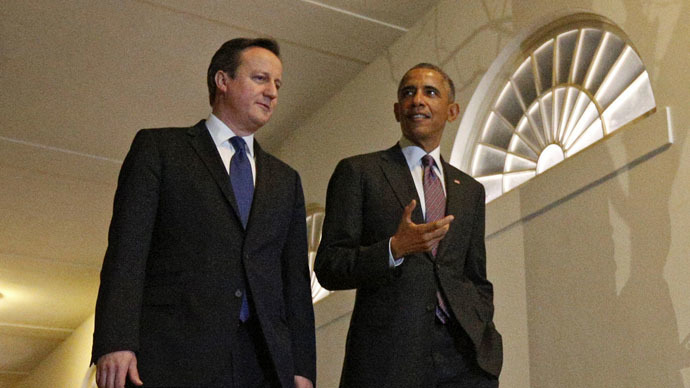 President Barack Obama has warned Prime Minister David Cameron that failure to meet its NATO defense spending target will weaken the military alliance and set a poor example to European allies. During private meetings with Cameron in Washington last month, Obama said that reducing spending levels from the current 2 percent of GDP standing target would undermine NATO agreements. There has been speculation that after the UK’s general election in May the Treasury will attempt to make further austerity cuts of £1 billion to the Ministry of Defense (MoD). However, diplomatic sources say the British Ambassador to Washington is now facing pressure from the US to get London to stick to the 2 percent spending level. Cameron told NATO members at the Wales summit last year it was imperative to spend more on defense, but has refused to commit Britain to the spending target beyond next year. He also said the level of defense spending is expected to reach 1.7 percent by 2020. “We’ve been saying, ‘we are worried that you are not going to hit 2 percent, after all you said in Wales,’” he added. While the UK government has promised protection of National Health Service (NHS) and pension funding, there are growing concerns among backbench MPs that defense spending will continue to be cut. “This is a critically important issue for the US and it is understandably concerned that the UK may fall below the target, especially after articulating so clearly in Wales how important it was,” she said. “This is a clear signal that the UK isn’t going to,” McInnis said. UK government officials have said “the military will not be able to spend 2 percent” if the economy continues to sputter at its current rate. Chancellor George Osborne said earlier this week he would “not prejudge our defense review” when asked about commitment to the 2 percent target. Military figures are concerned about the potential cuts to funding.